Take your best shots with SonyÂ´s camera expertise. 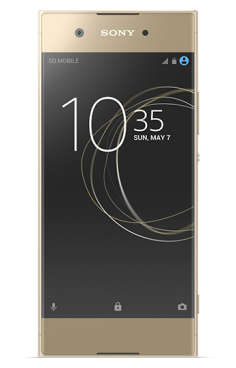 Xperia XA1 boasts a 23MP camera with Exmor RSâ„¢ for mobile sensor and F2.0 lens. More pixels, more light, the best-in-class images. Xperia XA1â€™s 8MP front selfie camera has a 23mm wide-angle lens that lets you fit lots of friends into the picture. The hand shutter automatically detects the palm of your hand and takes your selfie. A smooth, rounded form and a full-width 5â€ display, that leaves the frame barely visible. Xperia XA1 sits comfortably in your hand. Smart Cleaner automatically deactivates the apps you donâ€™t use and clears the cache, to optimise storage and memory. By automatically adapting the settings to the environment youâ€™re in, Xperia XA1 simplifies your everyday life. From Bluetoothâ„¢ headsets to chargers, thereâ€™s an Xperia accessory that matches your lifestyle. And since theyâ€™re made for Sony smartphones, you know youâ€™re always getting the best match.